If you are a passionate font collector then you have probably faced the daunting task of sorting font files. When you have thousands of them it requires a great effort to organize. DropIt to the rescue! The plan is to move fonts into subfolders based on their initial letters and type. This way subfolders will contain less files, making them easier to manage. Doing that manually is real hell. This is where DropIt steps in: simplifies the process to a single drag-and-drop! Tip before starting: some font files have abbreviated names, such as “MyFntBkCn.ttf”. You’ll probably find them more easier if you rename them to their font names, e.g. “My Font Black Condensed.ttf”. There are some great tools for doing this, my favourite is Free Font Renamer. 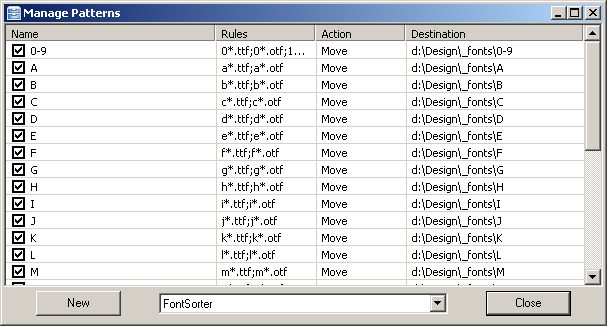 The “FontSorter” profile sorts fonts to subfolders based on their initials and their type. As you can see, postscript and raster fonts have their own folders while ttf and otf fonts will go to folders 0-9, A, B, …Z. The action is “Move” to move font files to their new destination. Destination is “d:Design_fonts” plus the actual subfolder’s name. You can modify the destination folder to suit your needs by manually editing the profile. You can even incorporate some internal environment variables like %ParentDir% or %PortableDrive%. You can download the FontSorter profile here. Extract the file to the Profiles subfolder of DropIt. Now drop some fonts on DropIt, then sit back and wait until the process finishes. ← Welcome to the new DropIt Blog!